Fast casual is growing faster than fast food, but where’s the proof, and if this can be proven, then where’s the best place to park your money? One trend that you might want to take notice of is the shift from quick-service (fast food) and casual dining restaurants to fast casual restaurants. For proof, consider a recent quote from Bonnie Briggs, an NPD restaurant industry analyst: "Overall, restaurant customers are trading down, foregoing some of their visits to full service places while increasing the number of visits made to fast casual restaurants. Fast casual concepts are capturing market traffic share by meeting consumers' expectations, while midscale and casual dining places continue to lose share." So the question becomes: Which fast-casual restaurant presents the best investment opportunity? To find out, let's take a look at Panera Bread (NASDAQ:PNRA.DL) and Chipotle Mexican Grill (NYSE:CMG). Let's also compare these upstarts to industry veteran McDonald's (NYSE:MCD). Fast food is the same thing as quick-service. The name has been changed to "quick-service restaurants" due to the negative connotation associated with the phrase "fast food." According to the NPD Group (a global information company), the foodservice industry still hasn't recovered from the recession. Still, the fast casual dining space has performed well. In 2013, fast casual restaurant visits increased 8% versus 2012. If that's not impressive enough, spending at fast casual restaurants jumped 10% over 2012. Comparatively, total spending at all restaurants improved just 2%. The reason for the superior performance has to do with better service than fast food restaurants and more affordability than casual dining restaurants. Food served at fast casual restaurants is believed to be fresher than what you find at fast food restaurants. As you can see, the fast casual space is growing at a decent clip. Also, keep in mind that the average check size is higher at fast casual restaurants than at fast food restaurants: $7.40 vs. $5.30. The average check at full-service restaurants is $13.66, but that doesn't mean much without increased traffic. Part of the reason for growth in the fast casual space is increased unit growth. For instance, fast casual units grew 6% to 16,215 in 2013. This might make the numbers above seem skewed, but only restaurants that are bullish about their futures will add more locations. Restaurant chains that are struggling will close locations to free up cash flow to pay off debt or reinvest that capital into better-performing locations. Panera Bread and Chipotle Mexican Grill are the top performers in the space, but is one a better option than the other? Source: Restaurant revenue data by YCharts. Notice that both companies have outperformed McDonald's. McDonald's is the largest fast food restaurant in the world, and despite its maturity, still manages to deliver top-line growth. Therefore, it shouldn't be eliminated as a potential investment, especially since it offers a dividend yield of 3.40% and it's only trading at 17 times forward earnings. 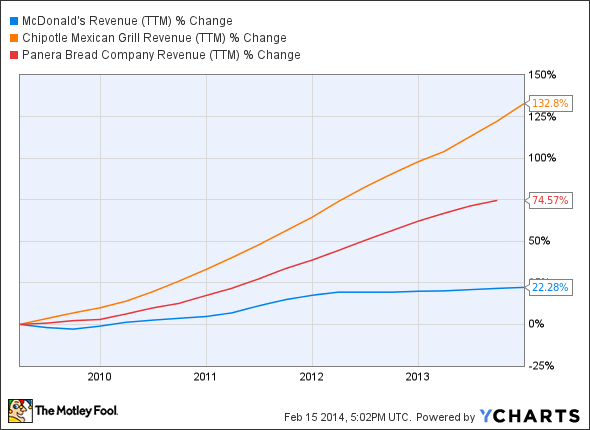 As you can see from the chart above, Chipotle Mexican Grill is growing faster than Panera Bread. But, Chipotle is trading at 53 times forward earnings, whereas Panera is trading at 27 times forward earnings. Therefore, Chipotle is more expensive and more susceptible to large swings if bad news comes out. However, this is a risk you must take when investing in growth companies. As long as the broader market is behaving, high-multiple stocks tend to trade higher. Furthermore, while Panera Bread is a high-quality company, Chipotle offers more diversification. In addition to its namesake brand, it has other growth brands in ShopHouse Southeast Asian Kitchen and Pizzeria Locale. Clearly, fast casual winning out over fast food and casual dining. And Panera and Chipotle are two of the top performers in fast casual. Therefore, it would be difficult to go wrong with either over the long haul. However, despite trading at a premium, Chipotle is growing faster than Panera and it offers more diversification. That said, you might want to consider Chipotle first, just remember its higher multiple could lead to more risk. As always, please do your own research to ensure these companies match your long-term goals.